Complete mass of NWA 3163. 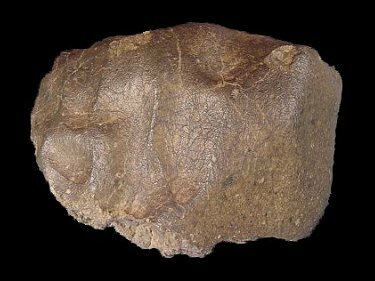 History: In August 2005, G. Hupé purchased a 1634 g stone from a Moroccan dealer in Ouarzazate. 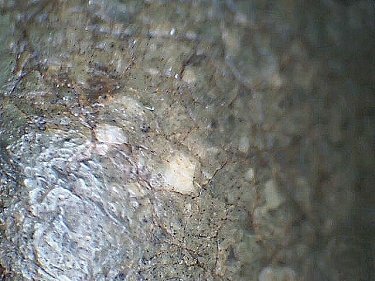 Petrography and Geochemistry: (A. Irving and S. Kuehner, UWS) The exterior is almost completely coated by a thin, transparent, greenish fusion crust. 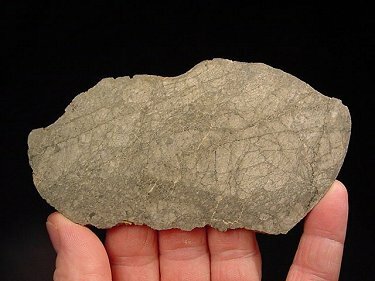 The pale gray interior has multiple shock fractures (with very minor calcite coatings) and some thin glass veins. Poikiloblastic recrystallized breccia, with larger grains of plagioclase (~70 vol%) enclosing much smaller grains (less than 100 µm across) of pyroxenes (~20 vol%), olivine (~10 vol%), and accessory Ti-chromite (Cr/(Cr+Al) = 0.714–0.736; Mg/(Mg+Fe) = 0.121– 0.143; TiO2 = 9.1–18.4 wt%), ilmenite, troilite, and metal (Ni = ~15 wt%). Anorthitic plagioclase (An97.4–98.2) has been converted by shock almost entirely to maskelynite (although domains of birefringent, less-shocked feldspar remain). 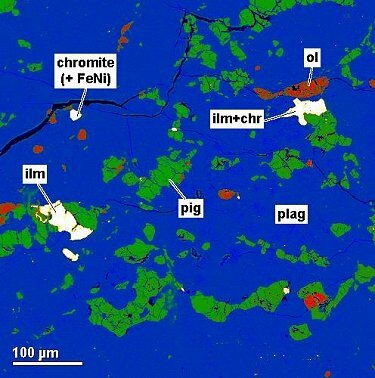 Pigeonitic pyroxene grains have very fine-scale exsolution lamellae of augite (Fs14.5–16.1Wo40.2–40.5; FeO/MnO = 41.7– 43.8) within orthopyroxene (Fs	32.0–33.9Wo4.4–5.8; FeO/MnO = 55.5–61.2). Olivine (Fa38.0–40.9; FeO/MnO = 91.7–110). Classification: Achondrite (lunar, feldspathic granulitic impactite). Specimens: A 20.1 g type specimen and one polished thin section are on deposit at UWS. GHupé holds the main mass. Shafer J. T., Brandon A. D., Lapen T. J., Peslier A. H., Irving A. J. (2011) Trace element geochemistry of a lunar granulite: Evidence from Northwest Africa 3163 (abstract). Hudgins J. A., Kelley S. P., Korotev R. L., and Spray J. G.
breccia Northwest Africa 3163 and paired stones: Comparisons with Apollo samples. Geochimica et Cosmochimica Acta 75, 2865–2881. Hudgins J. A. Spray J. G, and Hawkes C. D.
(2011) Element diffusion rates in lunar granulitic breccias: Evidence for contact metamorphism on the Moon. Dammeier R. , Moser D., and Osinski G. R.
(2010) Understanding lunar granulites through a terrestrial analogue study (abstract). Goldschmidt Conference Abstracts 2010, A205. Shafer J. T., Hall C., Lapen T. J., and Brandon A. D.
Goldschmidt Conference Abstracts 2010, p. A939. Kuehner S. M., Irving A. J., Gellissen M., and Korotev R. L.
A unique recrystallized, magnesian crustal sample (abstract). Fernandes V. A., Irving A. J., Kuehner S. M., Gellissen M., Korotev R. L., and Bandfield J. L.
of lunar granulite Northwest Africa 4881 (abstract). Korotev R. L., Zeigler R. A., Irving A. J., and Bunch T. E.
(2009) Keeping up with the Lunar Meteorites — 2009 (abstract). Hudgins J. A. and Spray J. G.
(2009) Lunar granulitic breccias: Differences between Apollo and meteorite samples (abstract). 72th Annual Meeting of the Meteoritical Society, number 5157. 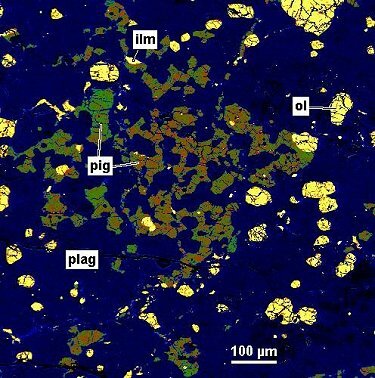 (2006) New geochemical data for a some poorly characterized lunar meteorites (abstract). Irving A. J., Kuehner S. M., Korotev R. L., Rumble D. III, and Hupé G. M.
(2006) Mafic granulitic impactite NWA 3163: A unique meteorite from the deep lunar crust (abstract). Complete 74.1g slice of NWA 3163. Closeup image of exterior surface of NWA 3163. False-color, back-scattered electron Image 1. False-color, back-scattered electron Image 2.